Homes in Riverwood are located on a quiet road nestled between the Blue River and Broken Lance Drive, the main artery through Warriors Mark. The subdivision was created on a small close-in parcel that wasn’t included in surrounding subdivisions. The Riverwood home sites were developed in the late nineteen nineties. A small retreat where most properties back onto the Blue River, Riverwood homes for sale are in high demand. 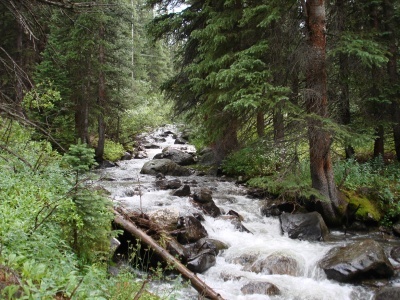 From Riverwood, it's an easy walk to the south end of downtown Breckenridge, and access to Highway 9 is quick, but this enclave is buffered by forests along the river and affords unusual privacy. Start your search with the available Riverwood real estate listings below, or read more about the advantages of choosing this subdivision. Fishing on the Blue River is a privilege that's easily used by owners of homes in Riverwood subdivision. All but a few of the lots border the river, and other have access through a common open space parcel. Neighborhood trails to town open space allow residents of Riverwood to walk to national forest. The base of Peak 9 isn’t far and the neighborhood is close to the bus stops in Warriors Mark. The town’s free transportation system also links to the free county-wide Summit Stage that goes to all the ski areas in the area. Any home for sale in the Riverwood neighborhood will be relatively new, with a large yard and total acreage between one-half to one acre. The lots are flat, the roads paved and just a few blocks from Highway 9. Because Riverwood is on the south side of Breckenridge, it is a natural choice for second homeowners coming from Colorado Springs or other points south. Size: 2947 sq. ft to 6041 sq. ft. Amenities: Blue River, close to town, large lots, flat terrain, near bus route, close to the base of Peak 9, near trails to national forest, attractive subdiviion, privacy. From the southern most stoplight in Breckenridge, at Boreas Pass Road, take a right. At the stop sign turn left and head west on Broken Lance Drive. Follow this drive as it curves left about three quarters of a mile and turn left on Riverwood Drive. 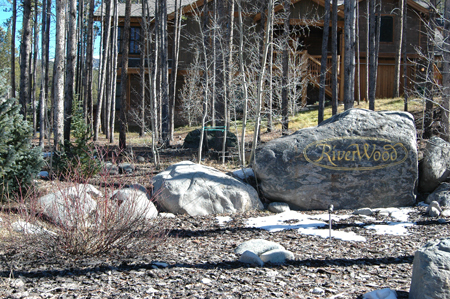 There is a large rock with Riverwood in gold letters engraved in it at the entrance. Would you like a tour of the Riverwood subdivision? Contact us today to learn more about homes for sale in this exclusive community.